Digitalisation has found its way into timber construction, with entire elements already being fabricated by computer-aided systems. The raw material is cut to size by the machines, but in most cases it still has to be manually assembled to create a plane frame. In the past, this fabrication process came with many geometric restrictions. Under the auspices of the National Centre of Competence in Research (NCCR) Digital Fabrication, researchers from ETH Zurich’s Chair of Architecture and Digital Fabrication have developed a new, digital timber construction method that expands the range of possibilities for traditional timber frame construction by enabling the efficient construction and assembly of geometrically complex timber modules. Spatial Timber Assemblies evolved from a close collaboration with Erne AG Holzbau and will be used for the first time in the DFAB HOUSE project at the Empa and Eawag NEST research and innovation construction site in Dübendorf. 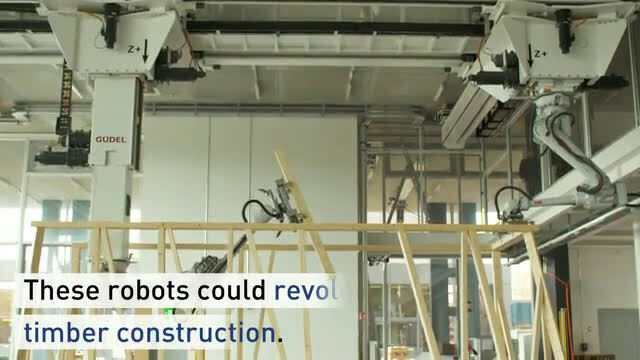 It is also the first large-scale architectural project to use the construction robots developed by ETH Zurich’s new Robotic Fabrication Laboratory. The robot first takes a timber beam and guides it while it is sawed to size. After an automatic tool change, a second robot drills the required holes for connecting the beams. In the final step, the two robots work together and position the beams in the precise spatial arrangement based on the computer layout. To prevent collisions when positioning the individual timber beams, the researchers have developed an algorithm that constantly recalculates the path of motion for the robots according to the current state of construction. Workers then manually bolt the beams together. Unlike traditional timber frame construction, Spatial Timber Assemblies can manage without reinforcement plates because the required rigidity and load-bearing result from the geometric structure. Not only does this save material; it also opens up new creative possibilities. A total of six spatial, geometrically unique timber modules will be prefabricated in this way for the first time. Lorries will then transport them to the DFAB HOUSE construction site at the NEST in Dübendorf, where they will be joined to build a two-storey residential unit with more than 100 m2 of floor space. The complex geometry of the timber construction will remain visible behind a transparent membrane façade. The robots use information from a computer-aided design model to cut and arrange the timber beams. This method was specially developed during the project and uses various input parameters to create a geometry consisting of 487 timber beams in total. 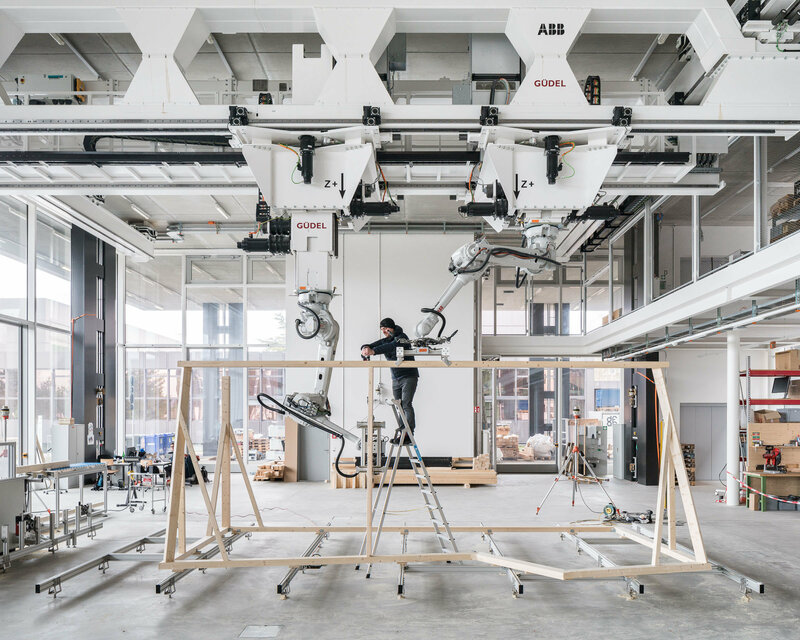 ETH Zurich has already completed a successful collaboration with Erne AG Holzbau on the robot-built timber roof of the Arch_Tech_Lab at the Hönggerberg campus. Thanks to Spatial Timber Assemblies, the company’s expertise in timber construction will make yet another contribution to ETH research. Kohler believes in the synergy effect brought about by the partnership: “Digital fabrication depends on the tremendous expertise required for craftsmanship. Conversely, digitalisation can improve craftsmanship and open up new opportunities.” Kohler also says the fact that scientific disciplines go hand in hand with industry is essential if technologies are to be used in real architectural projects after such a brief time.